Here is a collection of Native American vector art graphics. There is a mens shirt and womens dress clothing of the Blackfoot tribe. There is a Nez Perce lance with obsidian arrowhead-like tip weapon, a Blackfoot tribe buffalo skin shield with ceremonial feathers, and a medicinal smoking pipe from one of the “Plains Indians” tribes. These very detailed vectors come with special permission from our friends at VintageVectors.com. You can find more old engraving vector art there. 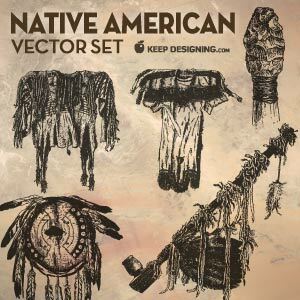 Plus high resolution PSD files are included in their Native American pipe and clothing vector downloads. Thanks for sharing these are beautiful! amazing! And so real… thx so much. D’ya have tippi pics? sandipras: I might be able to come up with some tipis. Really cool vintage set! Keep Designing: please contact me, I can send you very nice vectors!